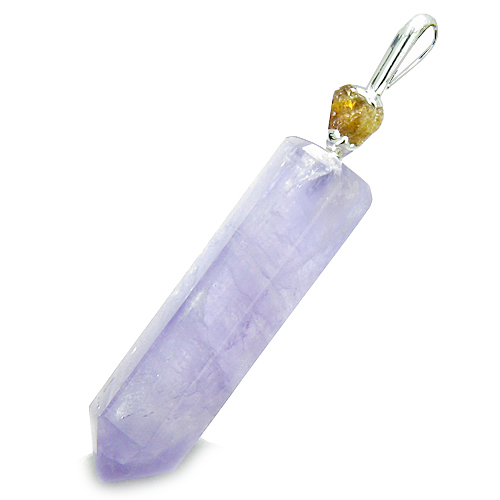 Brazilian Crystal Amethyst Wand Point holds a Setting with Citrine Tumbled Stone at the top. Size: Approximately 1 ½ to 2 inches long. Each Crystal Point is Hand Carved and Unique and No two pieces are ever alike. Dipped and Heavily Electroplated in Silver. Each Amulet is Made from Genuine Gemstone Crystal and may or will have Natural Inclusions and Specks. Comes with Gift Style Organza Pouch. This is Naturally Unique and One of the Kind Crystal Point pendant made from Amethyst Gemstone and holds Tumbled Citrine Gemstone Crystal at the top. This Crystal point is made from Genuine Gemstone and may have natural specks. It is Dipped in Silver and looks absolutely Gorgeous. These Crystals are Handcrafted from Brazilian Gemstones and made exclusively for Best Amulets. This Crystal is Money Good Luck Amulet and Safe Travel Protection Amulet, as it is made from Amethyst and Citrine Gemstones and attracts powers of Good Luck in Money and protects while you travel. Amethyst has come to be known as a Power Crystal for Good Luck. Amethyst as a healing stone contains sobering and calming qualities which allow this stone to be commonly associated with Peace, leaving its Owner calm. Amethyst has the ability to transform lower energies into higher and acts as a healer at all levels of mind, body and spirit. It has been deemed "nature's tranquilizer" by many healers because of it's effectiveness in relaxing not only the mind but also the nervous system. Amethyst is used to also increase intuition and psychic development. Amethyst is a Crystal of Protection, because it repels more than it attracts. It has been Used as Protection from self-deception, as well as a protection against witchcraft. Amethyst will increase your psychic abilities and enhance you intuition. AMETHYST has been used as a TRAVELERS PROTECTION stone for Thousands of Years. Many Cultures believed that AMETHYST Crystal in their Pocket will Guard them while they were Traveling to a Long Distance Destinations and just travel in General. If you Travel a Lot or just Planning, then you definitely need one. It also brings emotional stability and inner strength, and can enhance flexibility and cooperation, which are Extremely Important Factors in any Travel related situations. AMETHYST is such a Great Travelers Protector, that it suits any type of Travel, including Air, Sea and Driving.